Yep, that’s right – not long after I had posted my previous update (see below), I ended up exiting this trade to lock in pips… 74 pips to be exact! Closed trade manually at 98.08: +74 pips / +0.77%. You might be wondering why I did that with price just a few pips away from my profit target. Allow me to explain, mate! I noticed that although the 98.00 handle was tested many times in the past, price often didn’t go far beyond this handle. It would usually just barely touch this level, then rocket off in the opposite direction. And boy was I glad I did so! After that, the pair shot back up and it’s now back at the top of the range. Heck, I’m even considering selling this sucker for a third time! But then again, the ECB rate decision presents a lot of risk, so I’ll probably wait until that’s over and done with before I give this range another go. Anyway, congratulations to those of you who made pips on this as well. We all deserve a pat on the back! Hey everybody, I just wanted to give y’all a quick update on my trade! After entering at market at 98.82, we saw a couple of scary moments as price action fiercely tested the 99.00 major psychological handle. I remained as calm and collected as Larry Bird at the free throw line, as I was confident that the 99.00 level would hold. True enough, the resistance level held and the euro bulls cooled off. 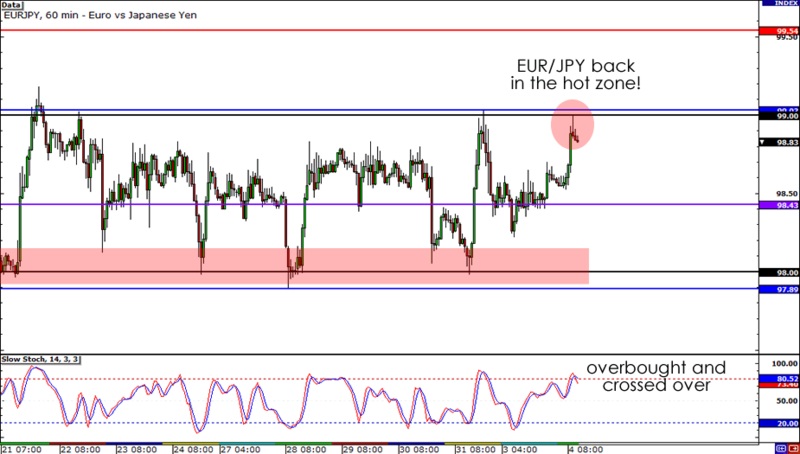 EUR/JPY proceeded to drop as we saw a slight case of risk aversion take place yesterday. The Spanish employment report didn’t help matters either, as it printed much worse than expected. With price about to hit my take profit point, I’ve made a trade adjustment and moved my stop to my initial entry point. This gives me a risk-free trade, so no matter what happens, I won’t lose a cent on this trade! As tempted as I am to close out my position already, I’m gonna wait till the New York session to see whether the euro sell-off continues. Hopefully, by the end of the day, my profit target will get hit – I wanna stay clear of the ECB rate decision! Congrats to those of you who also took this setup! And thank you for all your comments and suggestions! Keep them coming! As my momma always says, “Everyone deserves a second chance.” That’s why I’m giving this EUR/JPY setup another shot! Once again, this baby’s back at the top of the range. This time, it managed to tap the 99.00 handle and formed a sweet little shooting star on the 1-hour chart. And get this, Stochastic just crossed over and out of overbought territory! Aside from the technical side of this trade, I think there’s a solid fundamental reason why this trade will work out – I don’t see anything on the calendar today that has the ability to force a breakout. I just don’t think Spanish employment data has enough “oomph” in it to move the markets drastically. Besides, with the big ECB rate decision just two days away, I doubt the markets will commit to a position and cause the pair to break out of consolidation this early on. 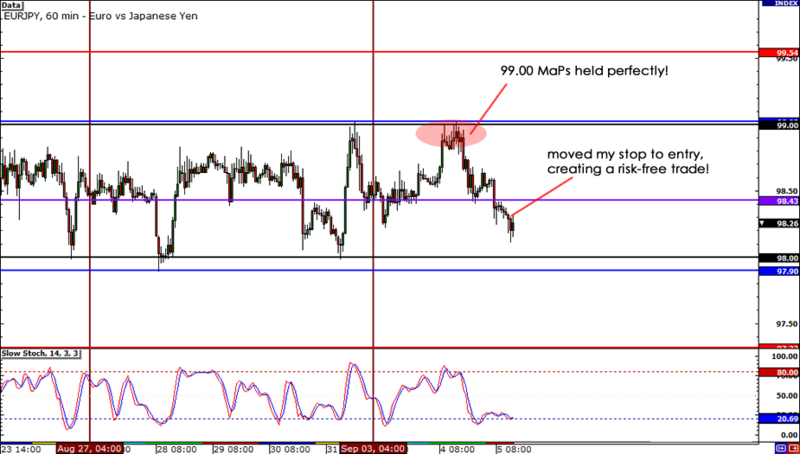 Sold at market (98.82), stop loss at 99.30, profit target 98.00. I’m setting my stop just above the highest spike, and I’m swinging for the fences with my profit target at the bottom of the range. As usual, I’m risking just 0.50% on this one. So what do y’all think of this setup? Will resistance at 99.00 hold?